Their missions aren't impossible... they just make them look that way. 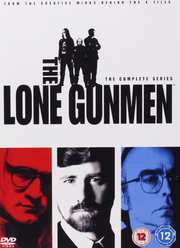 The computer-hacking, conspiracy-exposing Lone Gunmen are always looking for that next big government cover-up that would bring their newsletter, The Lone Gunmen, national attention. Whether in their secret underground office or in the back of their old VW bus, this bumbling and often socially inept trio is routinely laughed at by their peers. Now with a young, idealistic new member and a mysterious and exotic female who is always one step ahead of them, the Lone Gunmen are doubly determined to protect millions of Americans by exposing truths that some would rather keep hidden. "Making of The Lone Gunmen" Retrospective Featurette. Audio Commentary on Selected Episodes.